Indian silver from the Raj period, the era of British rule, was produced from the mid-19th century to the early 20th century. 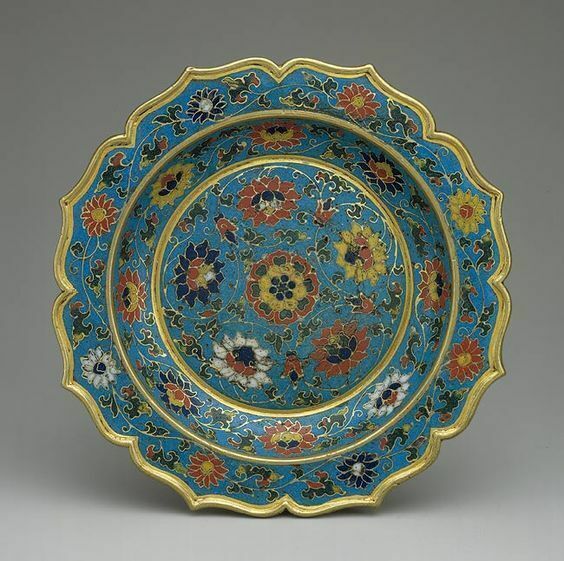 There are several distinctive styles, each varying in form, decoration, and technique. 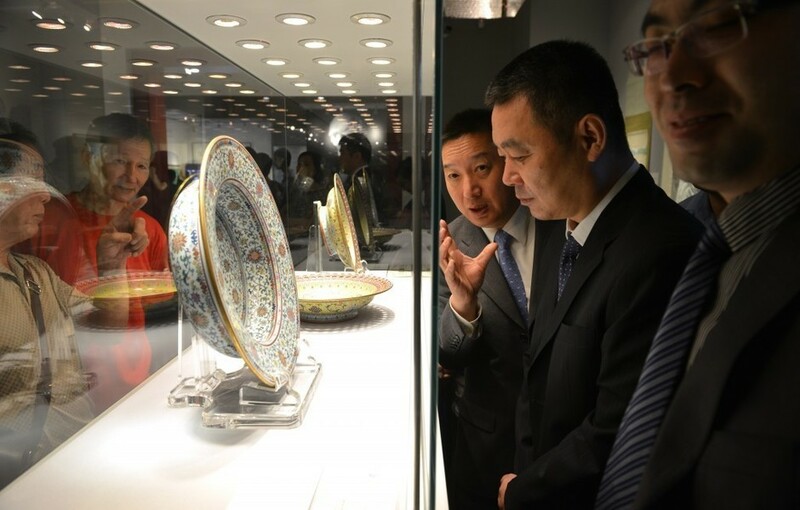 The styles are categorized by the region in which they were made. Although each style differs greatly, there are some common traits which all Indian silver shares. Generally speaking, Indian silver is profusely and densely ornamented with human and animal depictions or floral patterns. 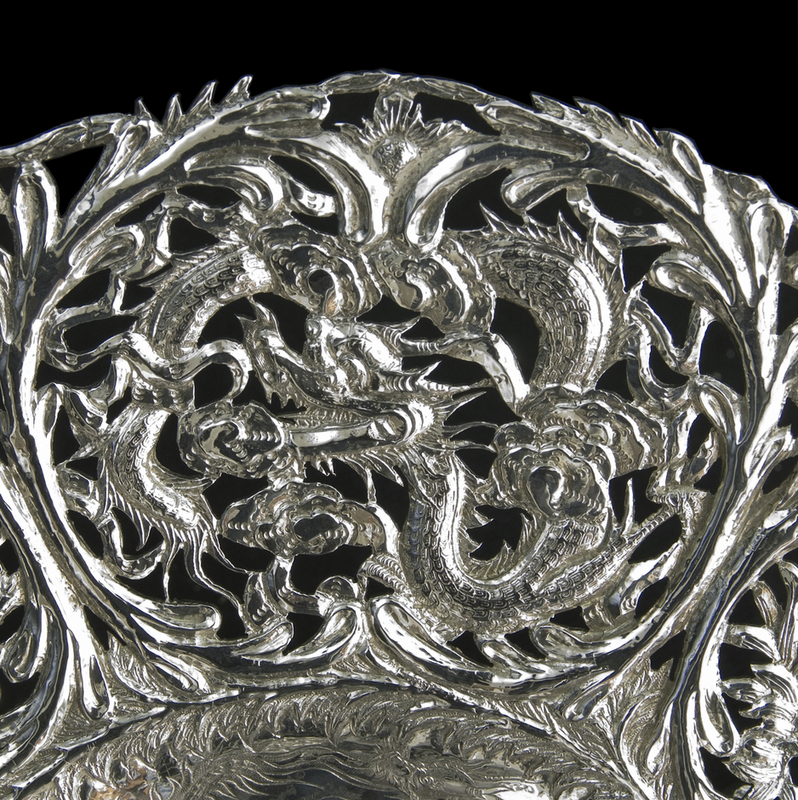 The immense amount of time the silversmiths were able to dedicate to each piece, allowed them to embellish the entire surface in great detail. Using small punches of varying sizes, the silversmith hammed the silver from the outside. 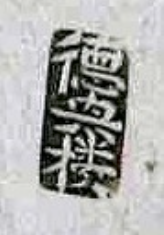 Known as chasing, this technique delicately punched in the silver surrounding the intended design. 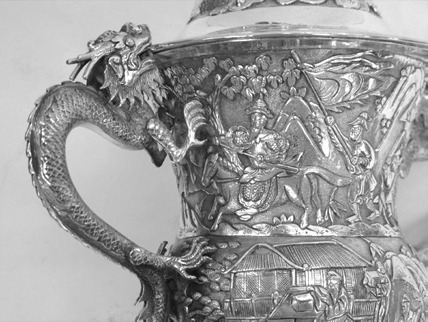 To create motifs in relief, the silversmith combined the techniques of chasing and repousse which required punching from the outside and the inside of the silver. The silversmith would first create the form of the piece and would then add the ornamentation. The forms and their decorative treatment derived from both European and Indian styles. Indian art was influenced by Islamic art – from Persia and other Islamic countries – as well as by Hindu art and these influences can all be seen on Raj silver. At first, silversmiths made Raj style silver for the local market, selling to travellers and British administrators. 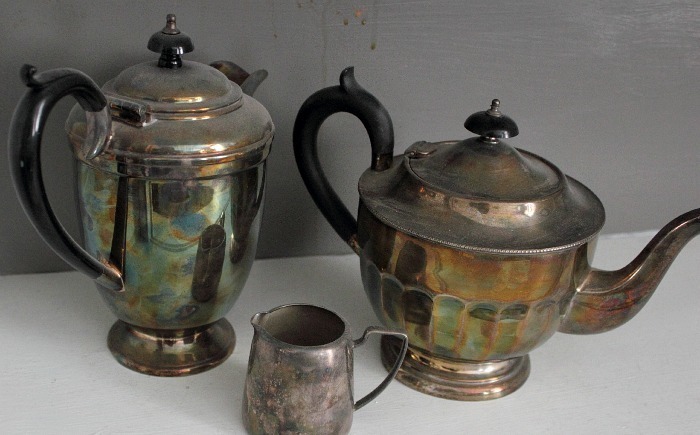 The world became aware of Indian silver after it was displayed at the 1851 Great Exhibition in London’s Crystal Palace, where it caused a sensation. Its popularity further reinforced when Queen Victoria was declared Empress of India in 1877. Europeans and Americans either brought it back from India, or, as was the case in England and the United States, bought copies from silversmiths in their own countries. Today Indian silver from the Raj period is mostly found in England and Europe with some pieces still remaining in India. Raj period Indian silver was made in both Indian and European forms. Indian forms can be divided into traditional Islamic and Hindu pieces. These includes: kashkuls, incense burners, sprinklers and bowls. 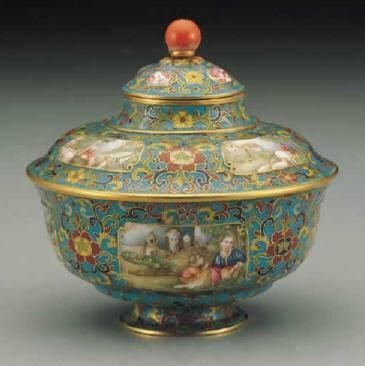 For their European and North American customers, silversmiths adopted European forms. These include: tea sets, goblets, tankards and casters. 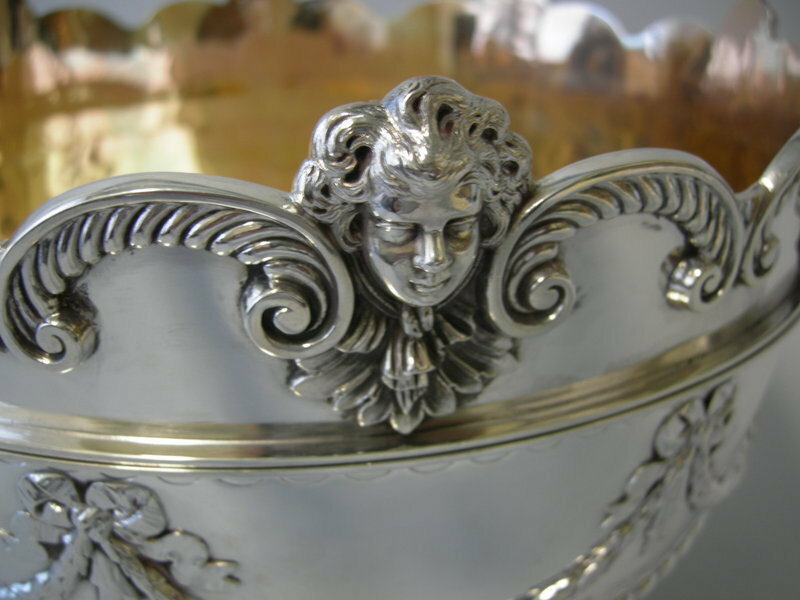 After the form was created, the silversmith would begin to embellish the piece. In general, the embellishment was done in Indian style, although occasionally pieces of European form were decorated in European style or in a hybrid of Indian and European. Each piece was made to be functional, although emphasis was placed on the embellishment. Occasionally, a piece was embellished to such an extent that its function was affected, became difficult or impractical to use. A wide variety of motifs and patterns in Indian silver can be seen, with several regions having their own distinctive style. These styles vary from flower head motifs in low relief to high relief depictions of shawl like patterns. However, the various styles do share certain characteristics. 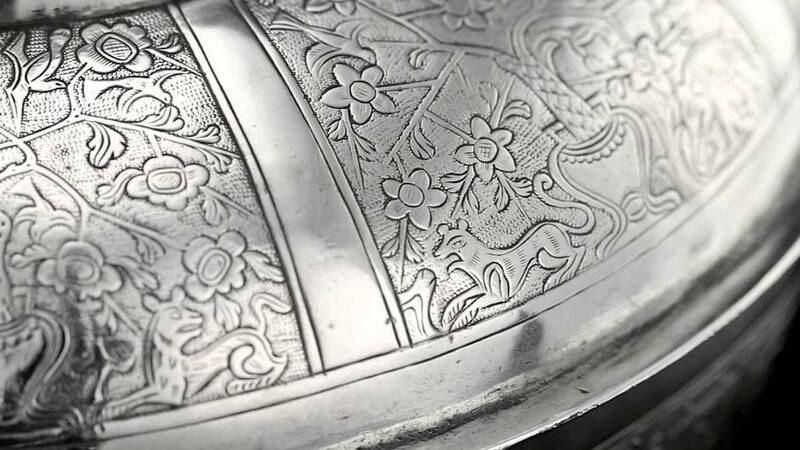 As stated earlier,Indian silver is usually profusely and densely covered with decoration, the entire surface of a bowl or upper face of a dish is often chased or embossed with patterns or depictions. Other frequently seen features are: a simplified acanthus leaf motif, which is often repeated in a pattern and used as a border; a snake used as a handle or in another form; the absence of a maker’s mark or date mark. Further distinctions can be made by discussing each style individually. Kutch (Cutch) silver was the most popular of the Indian silver styles and is defined by its scrolling foliate patterns which are clear and crisp as well as intricate and detailed. 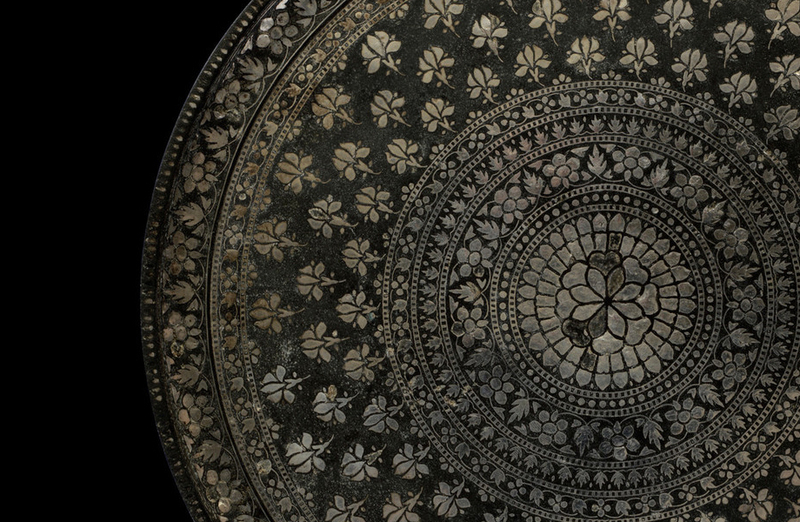 Amongst these patterns, the silversmith embossed depictions of animals, birds and people. 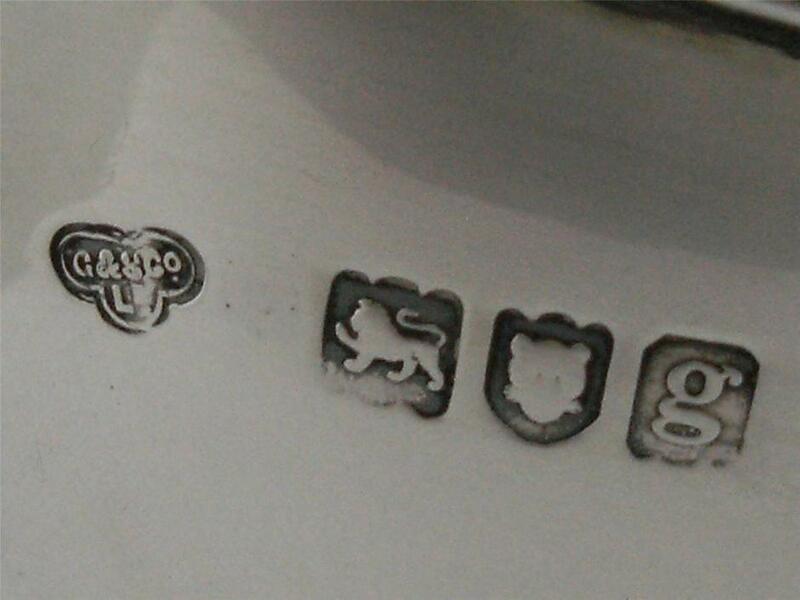 In one teapot, there is a depiction of a dog biting a bear, while an Indian man simultaneously hits the bear from behind. The man’s sword is raised, and his legs are planted on the bears back. This scene captures the excitement of jungle life but is represented in a slightly comic or humorous way. Further along the main frieze of the coffee pot, a tiger is hunting a deer, here the scene captures the exact moment when the deer has just realised what is happening – his expression shows us his hopelessness and resignation as he comprehends that escape will not be possible. Often the depiction in Kutch silver are humorous and beautiful. 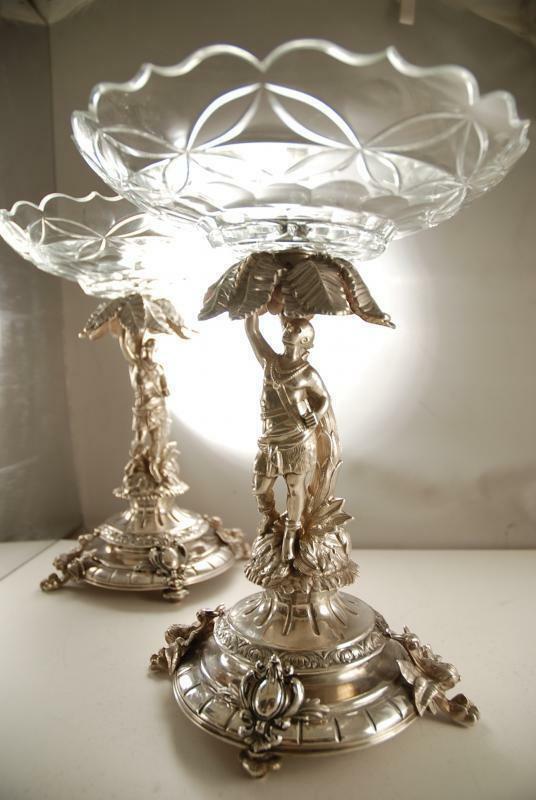 A second example, which displays the silversmith’s appreciation and attention to the natural world, can be taken from a large salver. On this salver, birds of all sorts are seen amongst the Kutch foliate. The birds are hanging, walking, sitting and flying around this jungle of flowers displaying their plumage or calling out in song. A second style of silver, from Kashmir, also incorporates foliate patterns, although it varies greatly from the Kutch style. Kashmiri work is softer, less sharp and more condensed. Located in North West India in the Himalaya Mountains the region has exquisite natural beauty which has been extolled by rulers and travelers for centuries. Drawing from the trees and plants in these beautiful surroundings, the silversmiths used motifs of chinar leaves, poppy plants and other local fauna to adorn their work. Influenced by the Middle East and the Islamic world, arabesque line work is also seen. With a closer look one can recognise fine scrolling patterns which, the connoisseur will note, closely resemble the shawls created in Kashmir. Not surprisingly, this has become known as the shawl pattern. Kutch – region located in west India, featuring scrolling, foliate birds or animals. The style is sometimes referred to by its capital, Bhuj. Kashmir – a region in the extreme north, intricate shawl pattern and foliate designs featuring elements of the chinar leaf, poppy plant and arabesque motifs. Alwar – located in north-east India, not many pieces were made in this style, it depicts animals and landscape with detailed texture. Calcutta – a city in the west of India which was an important centre of trade in British India, silversmiths adopted styles from other regions in India and also depicted the buildings and small factories of the city and surrounding villages. Lucknow – located in northern India, depicting foliate motifs, jungle life and village scenes. Madras – located in southern India, produced silver in the ‘Swami’ style, with deities and Hindu religious scenes depicted in relief.